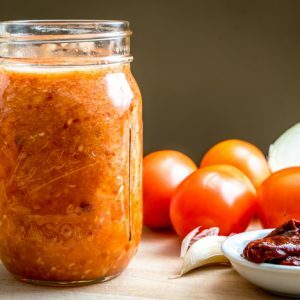 I’ve been getting some questions about the Tomato Chipotle Salsa used in the latest burrito post, so here’s a step-by-step account showing the easiest way to make it. It’s the perfect example of a salsa that has become multiuso. Not only does it work in the aforementioned burrito, but it can improve just about anything else you want to goop it on, including your finger. 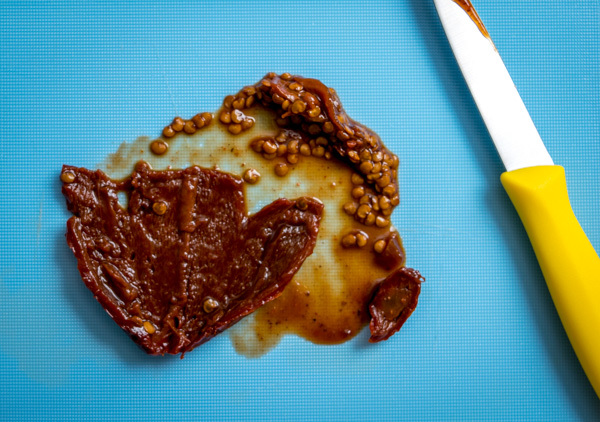 Keep some chipotles-in-adobo in the pantry and you’ll always be 20 minutes away from something delicious. Already got these ingredients on hand? 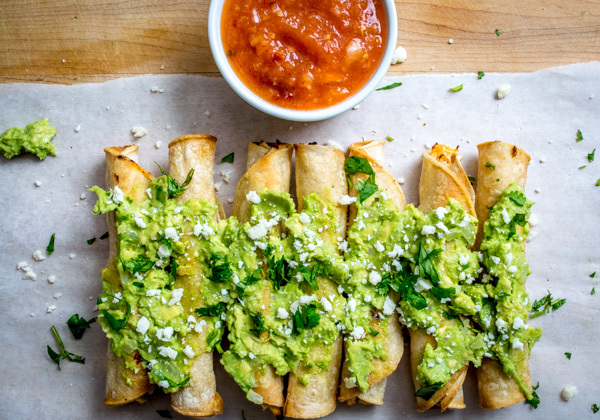 Here’s the other Mexican recipes you can make. OK first, do these look familiar? 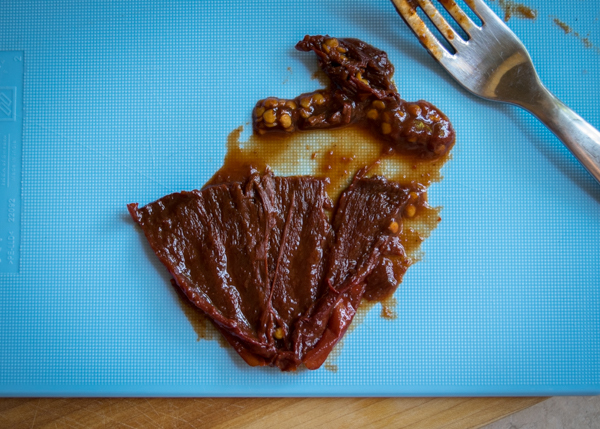 Dried chipotle peppers are canned in a tangy vinegar sauce that sweetens them up over time. If you’ve never bought them before, keep an eye out in the ethnic food aisles of the big chains. If no luck there, gourmet stores and Latin markets will have loads of them to choose from. Each can has around 6-8 chipotles inside. They have real kick so you’ll probably only need one or two at a time. After opening, I usually dump them in a small tupperware container and store them in the back of the fridge where they’ll keep for weeks if not longer. I think it’s best to cut off the stem and remove the seeds the first time you use them. This is a good way to learn how much ‘heat’ you like in your Tomato-Chipotle sauce. If you already know you prefer the spicier side, then it’s OK to leave the seeds in. 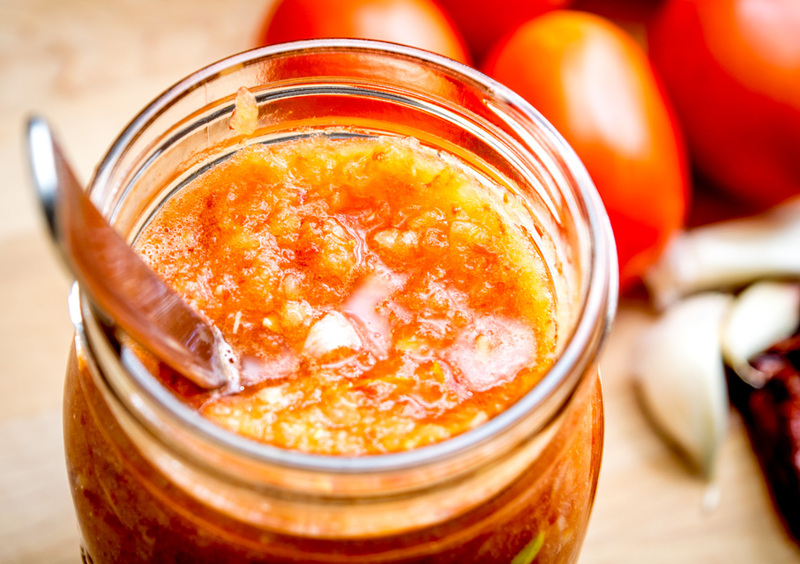 Aside from the darling chipotle there’s one other key to this salsa: roasting the tomatoes. This lowers their acidity and turns them a little sweeter. I find it’s easiest to use the oven at 400F. Add to a blender along with 1/2 white onion and 1 clove of garlic. 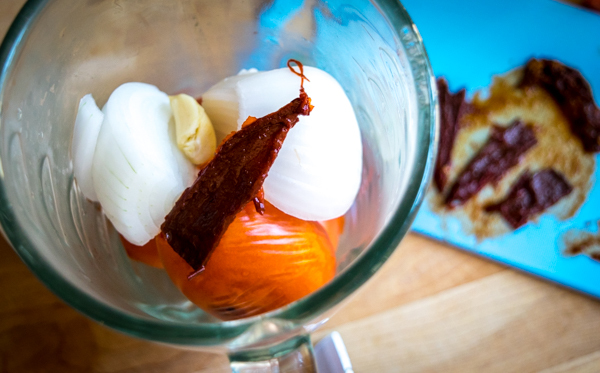 If you’ve never used chipotles-in-adobo before, slice the chipotle into quarters and add only 1/4 of it to the blender. And now the best part: taste it! Most people want a little more heat. Add another quarter, or half, of the chipotle. Pulse blend and keep adding chipotle until you like it. For me, that means adding a full chipotle to a 3 tomato batch, but everyone’s preferred heat level is unique. Serve immediately with your choice of tacos, quesadillas, fingers, etc. This delicioso Tomato Chipotle Salsa will keep in the fridge for a few days, after that I usually just make a new batch. You will too once you see how easy it is. And there’s one other reason that I won’t hesitate to make a fresh batch anytime I have the opportunity. Roasting the tomatoes makes the salsa warm. Yes! This adds another dimension to this salsa that you’ll rarely find in your local taco shacks. And now you’re an expert at it. Use the comments section below if you have any questions and I’ll get back to you pronto. 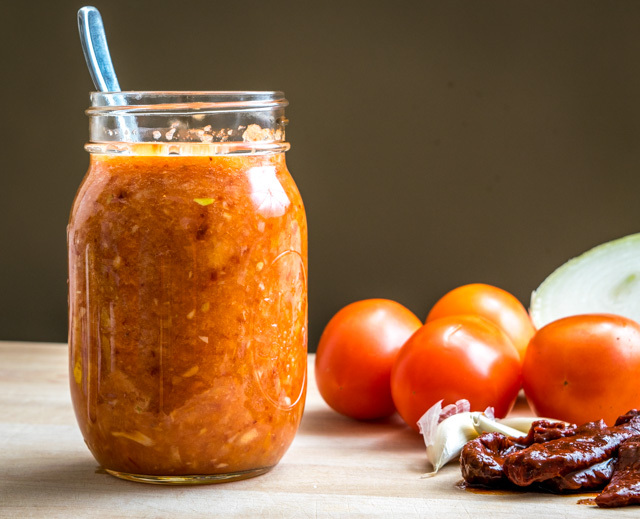 Keep some chipotles-in-adobo in your pantry and you'll always be 20 minutes away from a rich, warm Tomato-Chipotle Salsa. 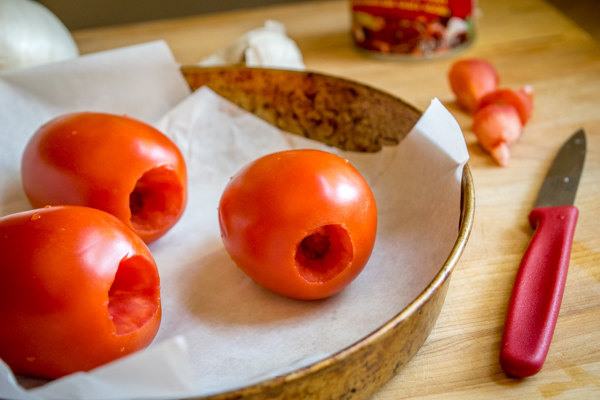 Rinse and de-stem the tomatoes. 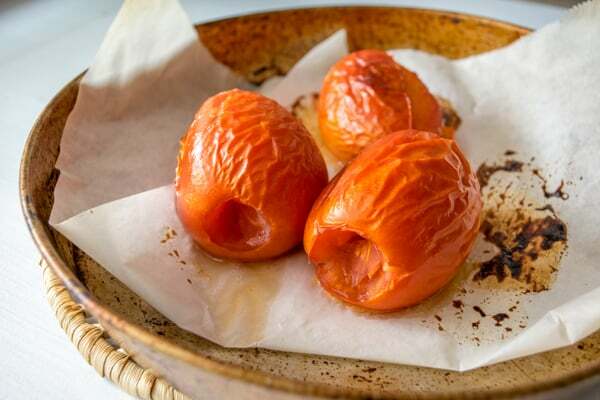 Roast the tomatoes in the oven at 400F for 20-25 minutes. De-stem and de-seed the chipotles in adobo. 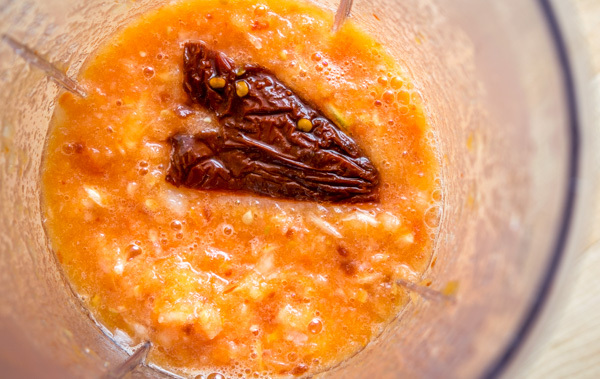 When the tomatoes are done roasting (20 minutes or so), add them to the blender along with 1/2 white onion and 1 garlic clove. Add only 1/4 of the chipotle in adobo. Pulse blend and taste for heat level. If you want more heat, add another 1/4 or 1/2 of the chipotle. Keep adding chipotle until it tastes "right" to you. Store the chipotles-in-adobo in a sealed tupperware container in the fridge where they'll keep for weeks, if not longer. 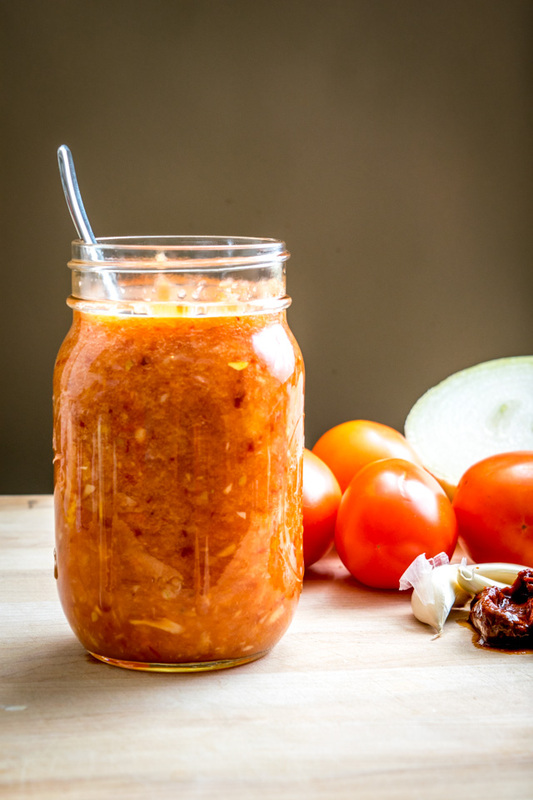 This Tomato Chipotle Salsa works great in Huevos Rancheros and Baked Taquitos. 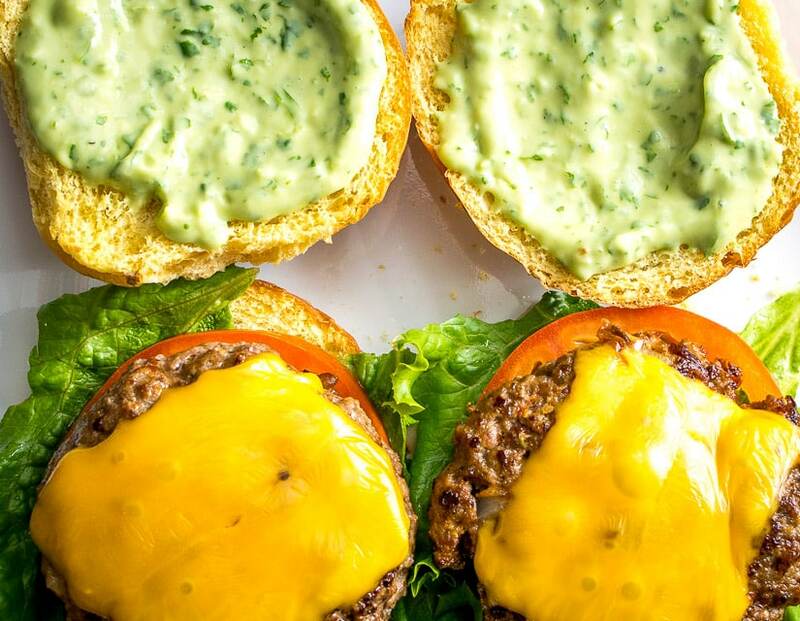 And if you’ve got chipotles on hand you can easily make our Chipotle Burgers with Creamy Avocado Sauce. I made this salsa tonight, and it was ok, but it was missing something. I added a little bit of salt, which helped a little, but still not what I was expecting. I was wondering, was I supposed to roast the onion and the garlic too? This is the second of your recipes that I’ve made, and first was AMAZING (like seriously amazing, I can’t get enough of those enfrijoladas!! ), So when this turned out underwhelming, I thought for sure it must be something I’ve done. Hi Holly, thanks much for your note, it’s so helpful to hear people’s experiences with the recipes. Bummer that this one wasn’t amazing out of the gate but I think it’s worth giving it another go because this salsa is such a good one to have in the arsenal. That being said, I know exactly what you’re talking about because I had a batch of Tomato Jalapeno Salsa come out meh a few weeks ago, and that’s a recipe that I’ve made hundreds of times and don’t question anymore. I think when this happens it’s because of some lackluster tomatoes. I’m not sure if it’s age or distance traveled or lack of sweetness when roasted or a combo of all of those. So I tend to buy multiple varieties of tomatoes when possible and definitely extra ones too in case I want to make an alternative batch, so that might be worth considering in the future. And regarding the other ingredients….I almost never roast the onion or garlic so I don’t think this is what you’re missing. And I’ve also noticed that adding salt to a lackluster batch makes a huge difference and I too have used salt to “save” a salsa before. Assuming you’ve got the heat to your liking from the chipotles, another band-aid would be to add some adobo sauce from the can to enhance flavor. The adobo sauce has some vinegar in it and it will add some additional zing if needed. 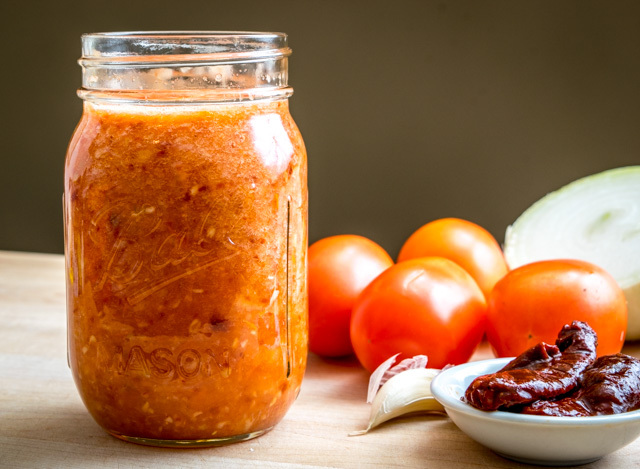 I know it’s annoying to spend time on a recipe and not have it come out up to standards, but I think it’s worth keeping at this one because it’s easily one of the top 2 or 3 salsas I make on a regular basis. Hope that helps a bit, feel free to get in touch if you have any other questions. Cheers. First of all, thank you for your thorough reply!! That was really helpful! Perhaps it would be worth making (and canning) several batches at the tomato harvest, when they’re at their most flavourful. Yeah, I’ve considered canning them before too but have never gotten around to it. I get loads of canning questions too so I’m sure it will become a habit at some point. So glad you are finding some keeper recipes! Thanks much for the feedback Holly it’s very helpful. Cheers. Today I tried something different while making this salsa. I’m a big heat fan, so I’ve been using a Jalapeno and 2 Chipotles plus an added tomatillo… just because I can. Rule breaker, I know. But then I ran out of fresh Jalapeños… So, I added a Jalapeño’s worth of your pickled kind (the reason why I ran out of fresh in the first place) and my God it was an amazing addition! A bit more heat and the zing from being pickeled! Prettysure I’ll be doing it this way from now on. Nice James thanks for the inspiration, I want to try that! I used 4 fresh tomatoes from my garden with this recipe as instructed. I’m on a restricted sodium diet, so I substituted Morton Lite Salt for regular salt. I also added about 1 1/2 tsp Penzey’s Salsa & Pico spice which truly made it smell like restaurant quality in my opinion. I can’t wait to eat some (once it cools off some). Enjoy!! Awesome thanks for your notes Cheryl! If I can them should I put them in a hot bath? If so, for how long? Is there any way to make this last longer than a few days? Maybe a bit of vinegar? Hey Peter, I’m glad you found a keeper salsa recipe! Yes, a splash of vinegar helps preserve it a bit longer, but to be honest I’ve stopped doing this because I’m always disappointed with salsa that’s a few days old when compared to freshly blended. You lose some of the zing and vibrancy after a couple days so I usually just make a new batch whenever I’m craving it. One shortcut you can consider is to re-blend salsa that’s been in the fridge for a couple days with some fresh ingredients. For example, stick another 1/2 chipotle and a garlic clove in the blender along with the leftover salsa and give it a whirl. This can liven it up quite a bit and it’s a good trick to keep in mind. Thanks! I like those tips, and I’ll try them. Any health concerns? Or just taste? Hi Peter, mostly just taste concerns. If you store it in airtight container in the fridge it will last for at least a few days, if not longer. Cheers.